The irish horse Arkle is one of the greatest racehorses to have lived. 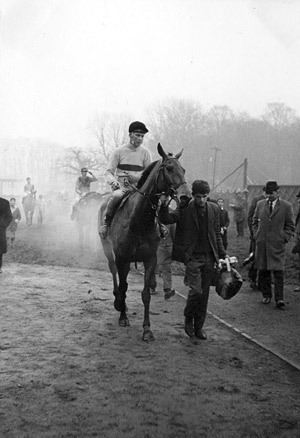 Arkle won the Gold Cup on numourous occasions and was a great chaser, he also ran at Sandown. Arkle won the Cheltenham Gold Cup on three occassions and his battles with Mill House were legendary. Arkle was also the first horse to capture the imagination of the British public outside racing circles. He left everyone who witnessed him in awe of his remarkable abilities. Even when he was still around, the general belief was that racing would never see his kind again. Foaled in 1957, Arkle was bred by Mary Baker and later purchased by Anne, the Duchess of Westminster. He was sired by Archive and the mare Bright Cherry. His grandsire was the undefeated Nearco, one of the best flat racehorses ever. Arkle ran in a total of 35 races, winning 27 of them. But what was truly amazing about his wins is the ease with which he dominated the competition. He routinely won at distances ranging from one meter and six feet to three meters and five feet. Arkle is also considered as the greatest horse to compete in National Hunt events, the official name in England and Ireland for horse races involving jumps over obstacles. He holds the record for the highest ever rating (212) given to a steeplechaser by Timeform, which provides official information on betting and handicapping to the British horse racing industry. Arkle's major wins include three victories at the Cheltenham Gold Cup (1964, 1965, and 1966), three victories at the Leopardstown Chase (1964, 1965, and 1966), two victories at the Hennessy Cognac Gold Cup (1964, 1965) and wins at the Irish Grand National (1964), Gallagher Gold Cup (1965), King George VI Chase (1965), and Whitbread Gold Cup (1965). Arkle was so dominant that he brought about an unprecedented change of rules in his sport. In Ireland, authorities decided to use two distinct weight systems in the Irish Grand National to level the competition -- one when Arkle was racing and one what he was not. However, even with this rule change, Arkle still won the 1964 Irish Grand National by a length, despite carrying a weight that was two and a half stones heavier than the rest of the field. One of the remarkable things about Arkle's era is that he shared the spotlight with another great racehorse, Mill House. The two would become close rivals throughout their racing careers. Their first showdown was in the 1963 Hennessy Gold Cup, where Mill House was the defending champion. The race was close until Arkle slipped a mere three fences from the finish line and Mill House stormed home uncontested. The two horses met again at the 1964 Gold Cup. Mill House was regarded as the best chaser at that time. But that would change shortly thereafter. The two were running closely until the last mile and a half when Arkle suddenly pulled away to win comfortably by five lengths. Arkle and Mill House would meet in several more races after that, but Mill House would never beat Arkle again, despite the increasing handicaps given to Arkle with each victory. In the end, Arkle cemented his place as the greatest steeplechaser of all time.